A nod to Antwerp’s ancient past is still visible in the architecture throughout the city. Not to be overlooked are the chunky brick buildings with little doors and secret alleyways that lead to hidden courtyards. While many are residential, a few courtyards are accessible to the public via small shops and cafes. We took a peak down a little alley near the cathedral and immediately stepped back in time. Known as Vlaeykensgang, this lush, hidden courtyard is a gem that dates back to 1591 and leads to a small maze of alleyways. After arriving at Antwerp Central Station, we set out for a day of city exploration. Our visit to Antwerp was sunny, relaxing day trip filled with dramatic architecture, hidden alleyways and plenty of Belgian beers. One of my favorite parts of the day was getting lost in exploring the details of Antwerp's historic buildings which range in style from medieval to gothic, baroque and renaissance and my personal favorite, art nouveau. Antwerp’s story features a long history, dating beyond the middle ages. The prosperous river port created a city that flourished in culture and trade. A successful diamond industry supported the affluent community that financed a thriving art scene, including painters like Rubens. Much of the architecture around the city center still reflects the Antwerp's dynamic history featuring medieval cobblestone alleyways, brick packhouses with wooden windows, and elaborate golden age architecture of the Grote Markt that shimmers in the sun. Looking for more? To join the conversation, visit this post on Instagram. Antwerp is a busy metropolis with a cozy feel. 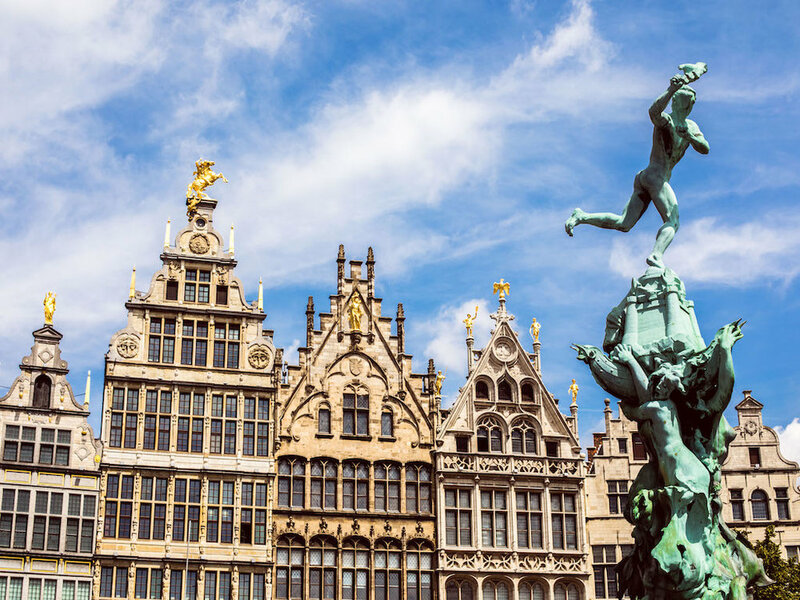 With a condensed city center, Antwerp is easy to explore by foot, from extravagant squares to little church courtyards. You'll begin with maze of wide boulevards, condensed down to cobblestone streets filled with tram lines, busy boulevards and dozens of bicycles dashing by. This chaotic scene slows down once you turn off the main road and step into the small city center. You'll find twisting, quiet streets that are perfect to wander, set to the dramatic backdrop of buildings from the flourishing golden-age. It recently dawned on me that after seven years of living in Amsterdam, I still had not ventured south to visit Antwerp. The bustling Belgian city is only two hours away from Amsterdam, which apparently, is just close enough for me to always postpone my visit for another time. Well, my delayed journey finally ended this summer when I headed to Antwerp with a friend for a creative day-trip full of photography. We arrived, disembarked and turned the corner to enter the center of the spectacular train station. Upon exiting the platform, our first sight was stunning. We immediately had to kink our necks back in an effort to take in the full spectacle as we rode the elevators up from the modern platform. My eyes wandered to take in the scene and I couldn't but get caught staring at the ornate, golden center piece. With a skeleton of iron and shimmering glass ceiling, the somewhat neo-gothic style of Antwerp’s station is impressive. One look at the grandiose, vaulted ceiling and it’s evident no details were spared. How stunning! This spectacular dome, arching at 75 meters high, was designed by Louis Delacenserie. It is truly an architectural gem! We spent a solid 30 minutes wandering up and down the dramatic staircase, staring up at the dome in awe and snapping away with our Cannons before even leaving the building to get to the center. Fun fact: Above ground, the train station is not only ingenious in terms design and architecture, there’s a special spot down below too. Techno lovers can dance the night away in a nightclub that’s right below the train station! The body heat and energy generated from all that dancing is recycled to power the club’s lights and sound! How cool is that? Curious for more? Join the conversation visit this post on Instagram.